European designer shoes are all the rage, so if you’re out looking for a pair of Manolo Blahniks or Gucci shoes, you need to know how to convert your American shoe size into a European size. Shoes designed and manufactured in Europe use a different numbering system, and you can spot this by looking at the stamp inside the shoes. It can be tricky to select the correct size for a European woman's shoe. Before heading out to the store or ordering online, do a little homework so you won’t end up with ill-fitting shoes. European women’s shoes are sized from 35 to 48½ . 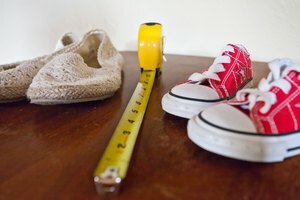 Most American women wear shoes from a size 5 to 9½. The corresponding size for an American size 6 is a European 36. A European 43 is an American woman’s size 10½. When purchasing European shoes off the Internet, always double-check with the size conversation chart for that particular manufacturer or website, as some of the size conversion charts on the web vary slightly. Although European sizes are the same across the E.U., a size 38 shoe made in Italy may fit differently from a size 38 produced in France, so always try shoes on before buying or email customer service for clarification if ordering online. U.K. shoe sizes are different from European brands, so be certain of the country of origin before converting the shoe size. Most of the European shoes that American women favor are expensive designer brands. Each brand runs small, wide, large, narrow or true to size. Generally speaking, women’s European shoes run smaller than American shoes. Ask your salesperson for advice if you have any doubts. Bruno Frisoni, Dolce & Gabbana, Prada and Versace tend to fit true to size; the highly publicized Manolo Blahniks run small and narrow, as do Christian Lacroix and Jean Paul Gaultier. Buy a half-size to a full size larger when purchasing shoes by these European designers. If you wear a U.S. size 7 (European size 37½), a size 38 or 38½ should fit you. Martin Margiela styles, however, tend to run larger than U.S. sizes. One of the best guides for measuring your feet to ensure proper shoe size is at the Bata Industrials website. The PDF sizing chart contains a foot diagram and separate scales for sizing feet for French, American, British and Italian shoes. If you are a designer or European fashionista, check out shoe message boards and groups to discuss European sizings with other fashion fanatics.